When my friend Paul saw this recipe in The New York Times, he gave it a try and told me about how utterly fabulous it was. Naturally, I was more excited than you could imagine because I am obsessed with everything pasta and everything egg. Putting these two items together? Hello--where has this been all my life?! I was overjoyed to try the recipe with Paul as my pasta and egg leader. Naturally, the two of us being such foodies and all, we couldn't just make the recipe the way it was. Instead we have added a couple of our own twists to it. And, if I dare say, we also made the recipe a little more clear. And I took pictures. Once you make this pasta recipe, you are going to devour it. It's amazing. It's simple. It's perfect. So we're going to start by lightly crushing some cloves of garlic. Paul and I are HUGE garlic fans, so we used 7 cloves. We're going to use them to infuse some olive oil with their goodness. I love this picture. I mean, it sort of goes without saying that you will need to add oil to your pan and heat it, but I love the way the reflection of the oil and vinegar and the tile came through in the oil. Anyway, you are going to heat the oil over medium -high heat. Then you are going to add your garlic cloves to the hot oil and "blonde" them. Do that on each side and then set them aside. 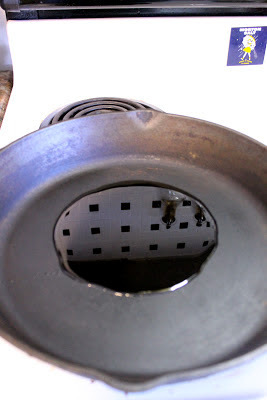 You can move the pan off the burner and turn the burner off. You will be re-heating the pan in a few, though. But when I saw them sitting there like that, well, I ate them! Well, Paul and I ate them together. We love garlic. No risk of being bitten by vampires here. I am a regular consumer of garlic, raw or "blonded." At this point, our water was boiling. So, we got our half pound of pasta, broke the pasta in half and added to the water, which was salted. The trick, we believe, to this recipe is to make the pasta and when it's done, get your eggs going. So, we had our eggs ready. We used four of them. Right before your pasta is done, put your pan back on the heat, this time on medium. 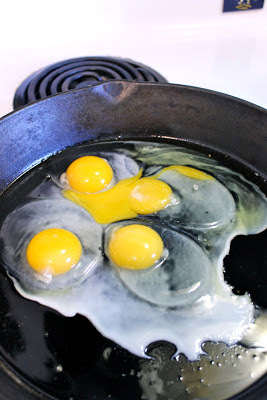 What we are basically going to do is put the eggs in the pan and cook them a little bit. Then we are going to throw the pasta in and toss them together, cooking the eggs fully with the heat from the pasta. Sounds like fun, right?!?! So, your pasta is done and you are going to put your eggs in your garlic-infused olive oil over medium heat. Now you can drain your pasta. Let the eggs cook a little while your pasta drains. At this point, you are ready to throw your pasta in! 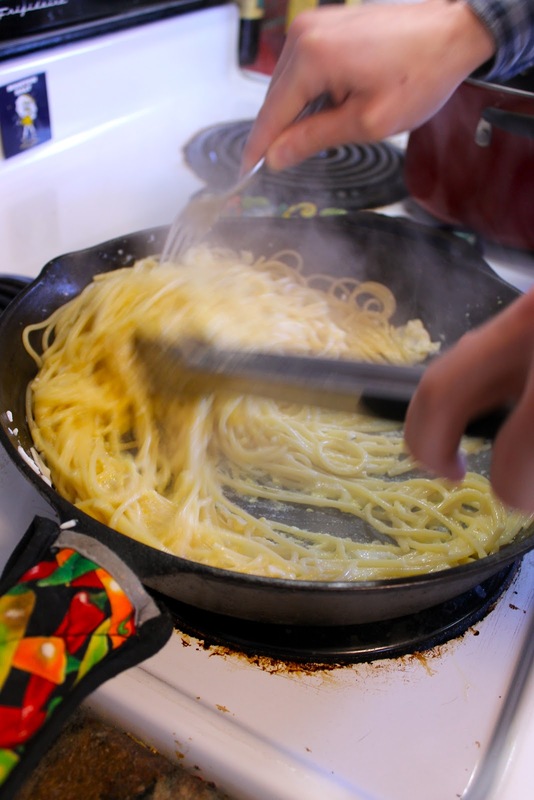 Using some tongs, quickly toss the pasta and egg in the pan. This will fully cook the eggs and coat the pasta. Then we transferred the pasta into our pasta pot (which is now empty) and added some red pepper flakes (to taste), a palmful of parmesan cheese, and some fresh ground pepper. Seriously? This was SO GOOD that Paul and I barely talked at all during our lunch unless you count, "MMMMMMMMM" as a word. Meanwhile, in a skillet heat your oil over medium high heat. 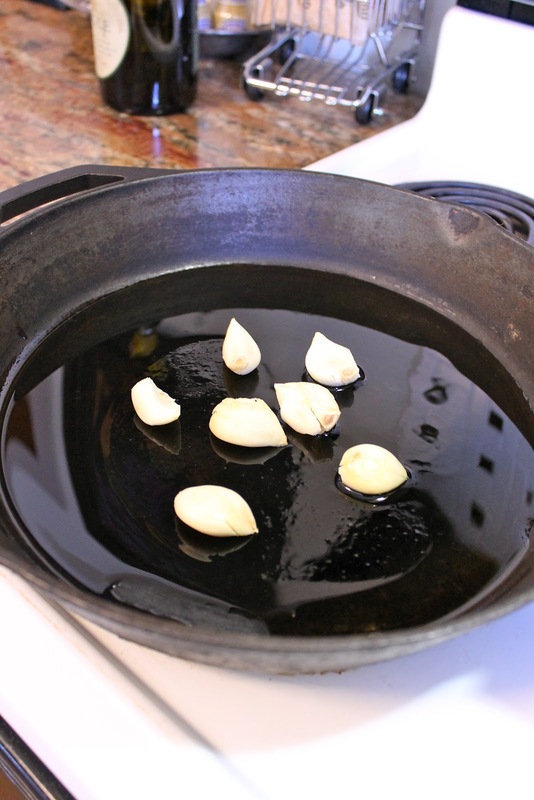 Add your cloves of garlic to the oil and "blonde" them on either side, about 2 minutes total. (see picture above for blonding reference.) Set garlic aside, ponder them, and then eat them. 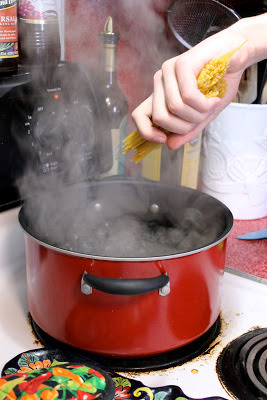 Break your pasta in half, if desired and then add to salted water which should be boiling by now. Allow the pasta to cook until al dente, about 8 1/2 minutes for regular pasta. 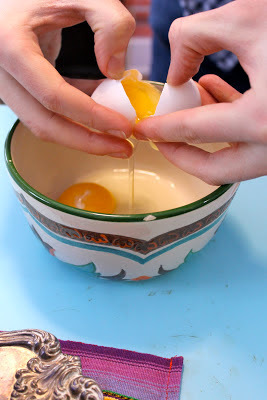 Crack your eggs into a bowl and have them ready. 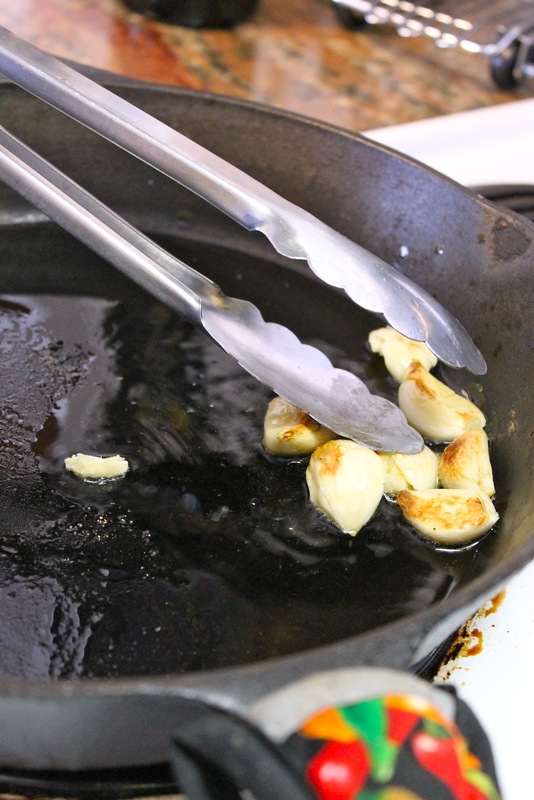 Just before the pasta is done cooking, return your skillet (with the oil) to the burner and bring it to a medium heat. When pasta is done, put your eggs into the skillet. 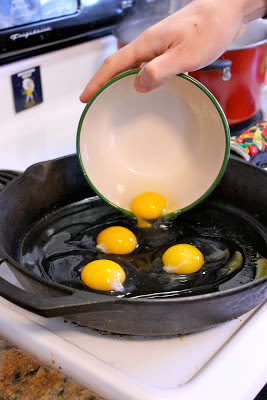 When eggs are white on the bottom, throw your drained pasta in the pan and using a set of tongs, stir it to combine evenly with the eggs. The eggs will cook as they coat the pasta. Transfer all of it back to your pasta pot, which should be empty. Add your red pepper flakes, parmesan cheese, and fresh ground pepper. Divide between two plates and try not to inhale all in one bite!! My gram used to make me a very similar breakfast on saturday and we called it breakfast spaghetti. We used cold leftover spaghetti, threw it in a fry pan with chopped garlic and some EVOO. When the pasta was warm she added 2-4 beaten eggs to the pan and just tossed thru the pasta. Top with Romano and pepper....yum! I know you don't remember me but your mama does!